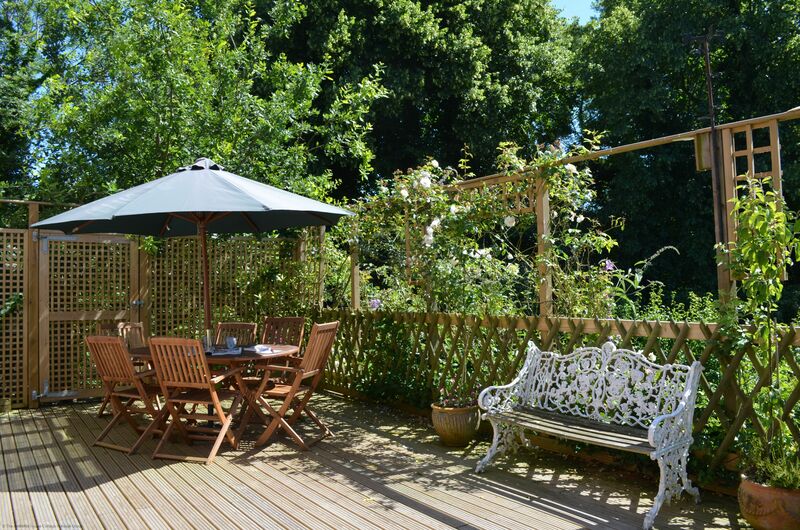 Stay in this extended Victorian Gate House within minutes of the historic town centre of Rye, the perfect base for exploring 1066 Country on bike or foot. You enter the property into the main hallway with space for hanging coats and leaving shoes. 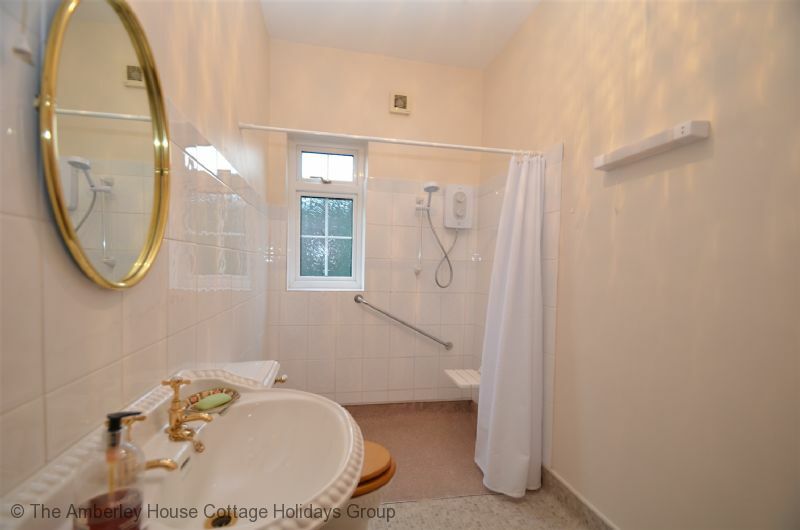 A door leads to the ground floor double bedroom with ensuite shower room, suitable for a guest with wheel chair needs or limited mobility. Stairs lead up to the two further bedrooms and family bathroom. 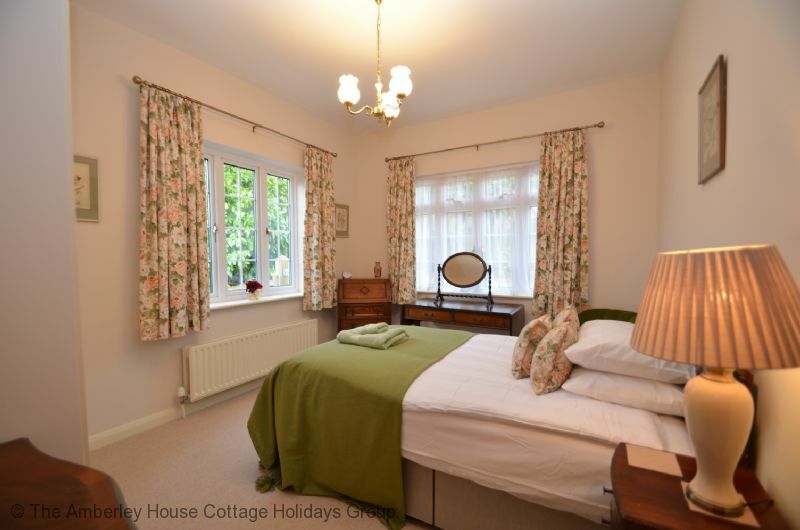 One is double with views to the front and the second bedroom, with the super king bed and the option to split into a twin with views across the gardens. 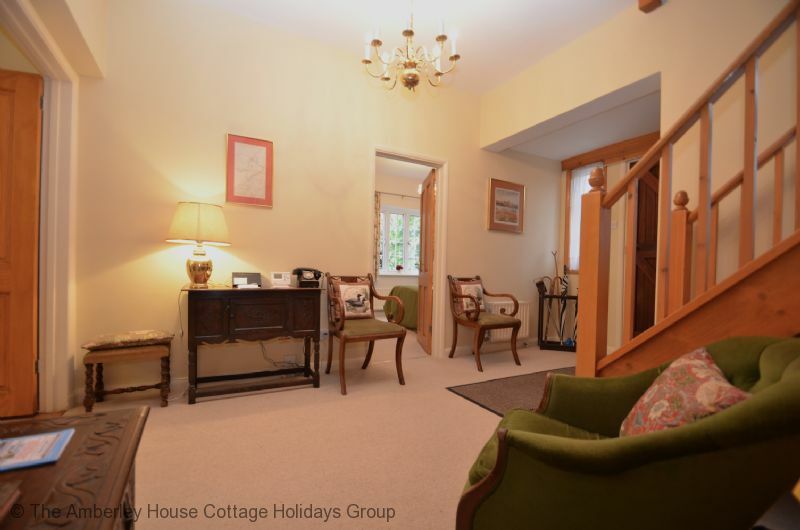 Off the hallway are double doors that lead into the lounge, with wood burning stove, comfy sofas, TV with Blue-ray player, bluetooth speaker to pair your mobile phone and tablets to, a selection of books and board games. 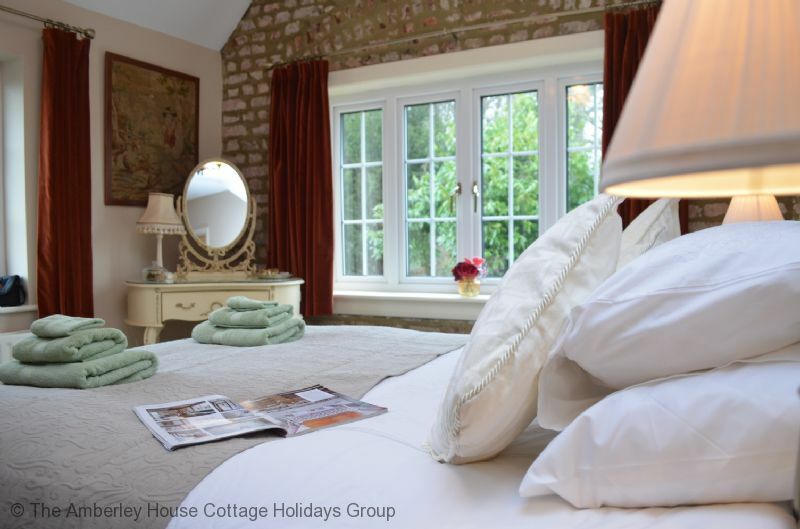 A lovely room to relax in and plan your days or return to after a day visiting local attractions. From the lounge you can enter the kitchen diner one of two ways, the dining area has double glazed doors opening onto the lounge and there is a further door opening straight into the kitchen area. 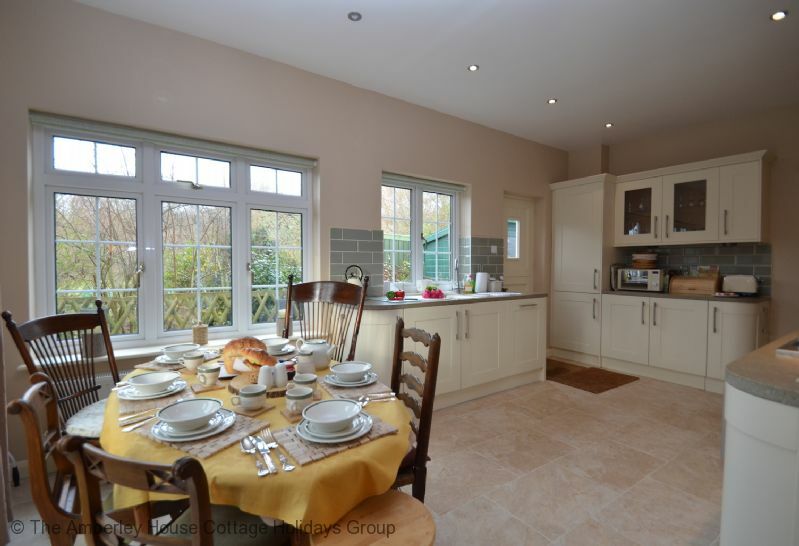 The kitchen is modern and caters for all your holiday needs, dishwasher, large fridge freezer and washer dryer. The dining table sits in front of the double french doors that open out onto the large enclosed decked area. There is a further door off the kitchen which opens out onto an alley where you will find secure storage for up to 4 bicycles, should you wish to bring your bicycles away with you. There are many pleasant cycle routes available from the property and a chance to explore the area at a much slower pace. The decked area has seating and is the perfect spot to enjoy your morning breakfast or evening tipple. To the front of the property there is a maximum parking of three cars, which is a bonus when visiting the medieval town of Rye. 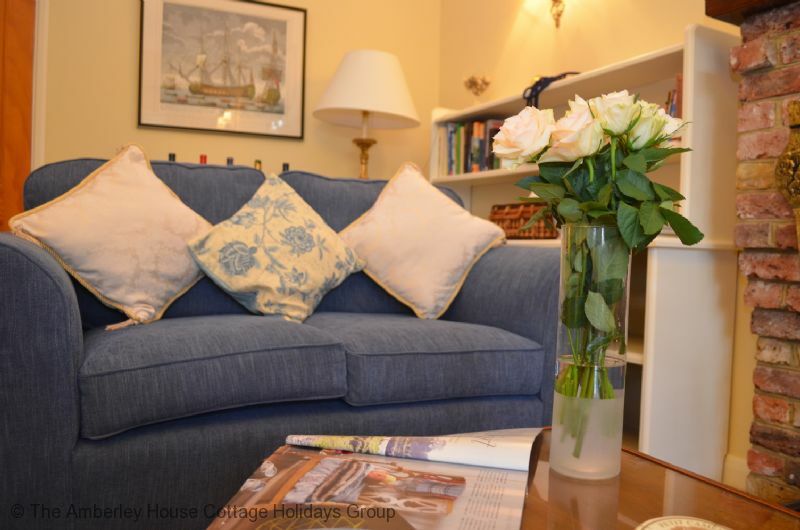 Mountsfield Lodge is perfectly situated when choosing to stay in the historic town of Rye. Positioned within minutes of the town centre you really could just park your car when you arrive and explore locally on foot or bike for the duration of your stay. Rye is a pretty cobbled Cinque Ports Town, with independent shops, antique sellers, a good mixture of coffee and tea rooms, a variety of restaurants and history dating back to medieval times and a colourful smuggling past. 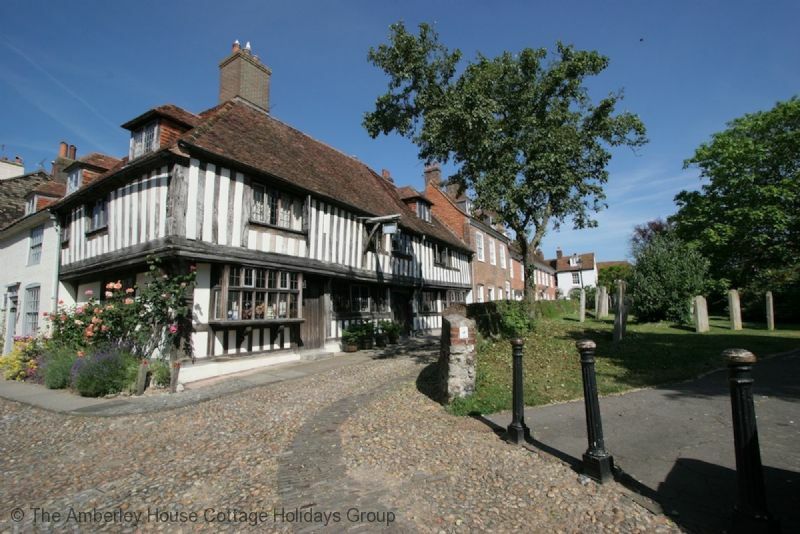 A good first destination would be a visit to Rye Heritage where you can find out about the medieval town’s past, right up to modern times while you watch the ‘ Sound and Light Show’. 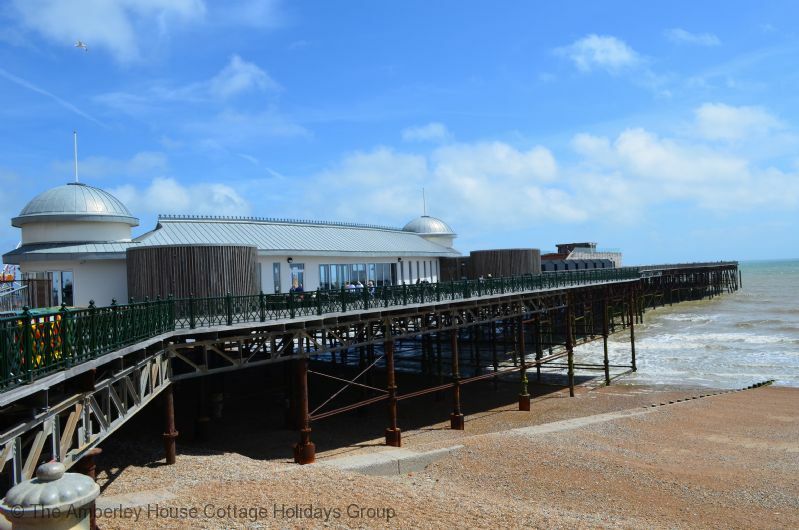 Here you can pick up an audio guided tour, local attractions information and even book one of Rye’s ghost tours but only for the brave among you.For children in the party, there is a skate park and play park all within an easy 10 minute stroll of the property. 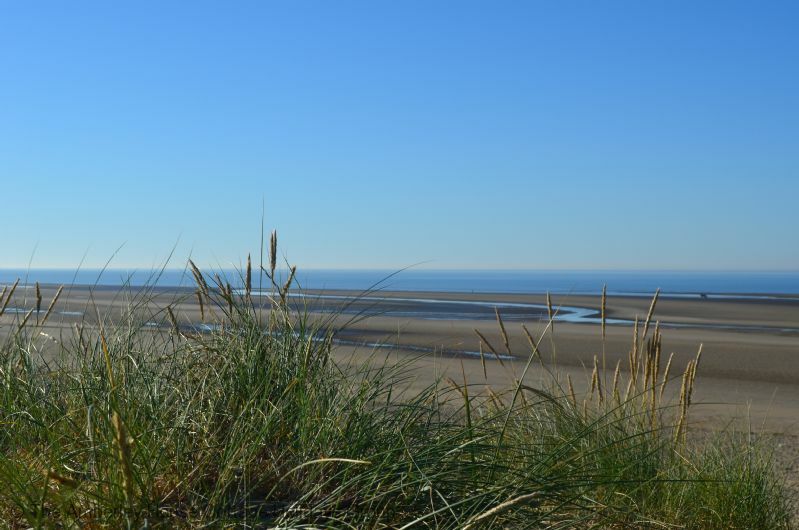 If you are a keen walker then there are many footpaths and trails that can be picked up from the holiday property and you will soon be out into beautiful rolling countryside, whether you head towards Tenterden, amble along the Military Canal towards Appledore and the Romney Marsh or towards the beautiful sand dunes at Camber Sands. 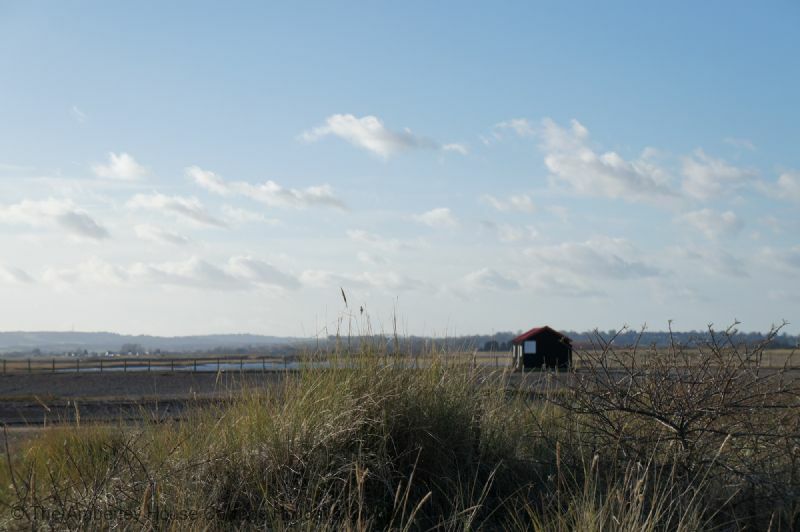 If you are an avid bird watcher then you are spoilt for choice, Rye Harbour Nature Reserve only two miles away and is a popular destination, Hastings Country Park a little further but beautiful cliff top walks and a chance to view nature close up or the RSPB reserve at Dungeness. 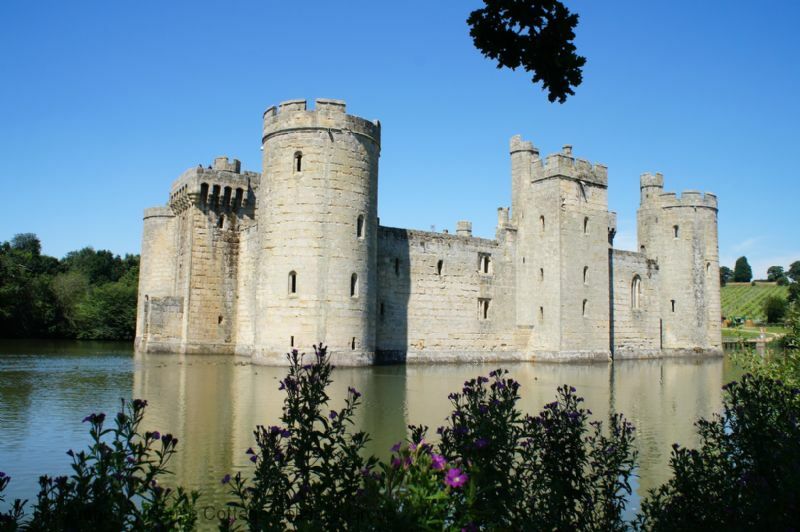 This whole area is of course 1066 Country and we could comment forever about what there is to see and do. Suffice to say, no visit would be complete without a trip to Battle and Battle Abbey. Mountsfield Lodge - 487039 Mountsfield Lodge. 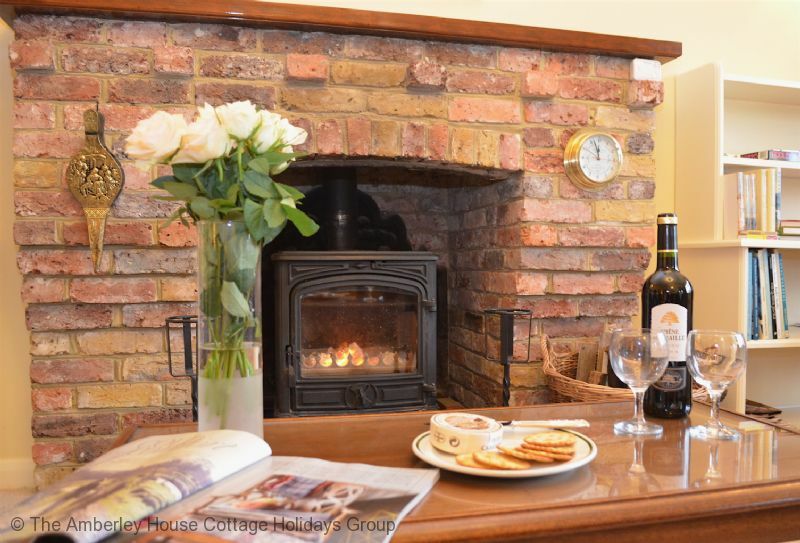 Victorian Gate House family friendly holiday cottage with ground floor bedroom & bathroom, wood burning stove & parking, in one of England's prettiest town's, Rye. "A really lovely house. Our host had thought of everything with welcoming touches. So clean and comfortable and spacious that we were happy to relax there but it was also so very handy for the town. Loved all the cafes, restaurants/pubs in Rye. It was very relaxing and quiet with lovely wildlife in the garden. Thank you, we will be back..."
"We had a delightful stay at this beautiful Lodge in Rye. Everything was so perfect for us - including the weather. There was a very high standard of excellence with this property which we were quite amazed with. Very comfortable and very clean indeed and it really did feel like home from home. We cannot speak too highly of Mountsfield Lodge. Our stay was most enjoyable. Thank you so very much." "Thanks for a lovely weekend and for a nice comfortable place to stay. We had an enjoyable time despite the awful weather. " 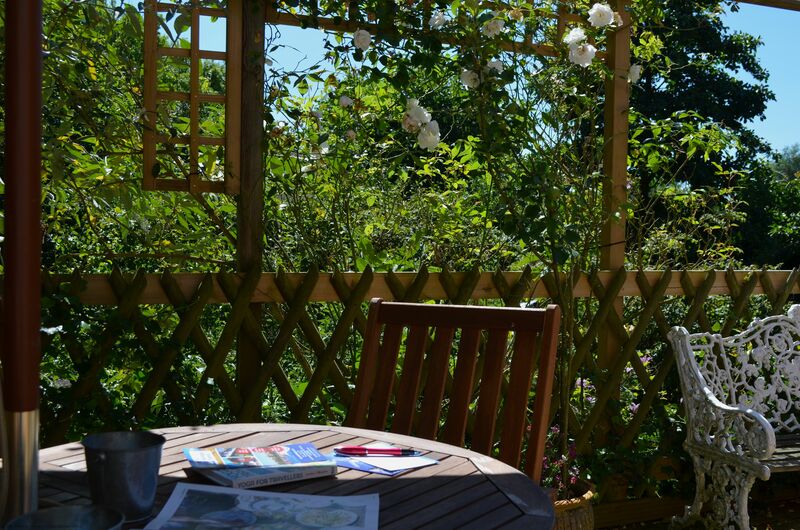 "Mountfield Lodge is an oasis of joy being superbly located for Rye and beyond. The Lodge is large, warm and well equipped. The only small drawback is the lack of a shower in the upstairs bathroom. We were 3 couples and the house was perfect for us. We will definitely return." 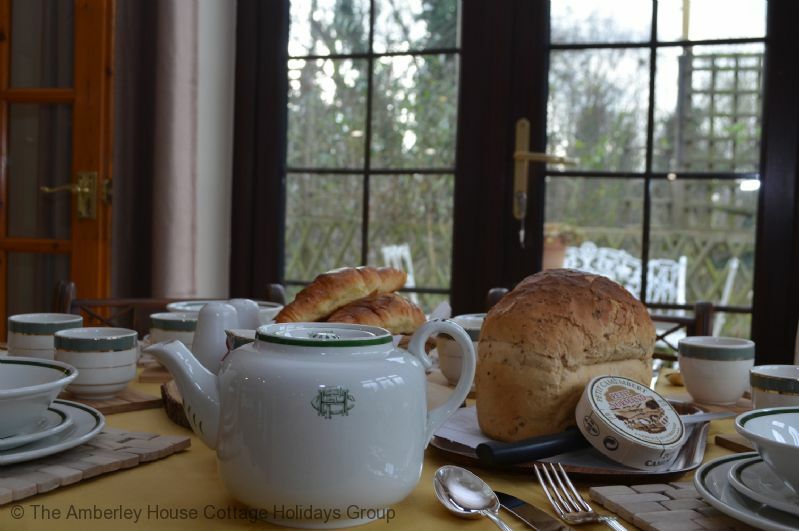 "We stayed at Mountsfiled Lodge during October half term. It was really clean and well presented. Despite the time of year, the Lodge was really warm and the log burner was a delight in the evenings. The kitchen was well equipped with modern appliances and plenty of mugs/plates and glasses. The house is only a short walk away from the main town centre of Rye, which made it easy to explore the town, pubs and restaurants." 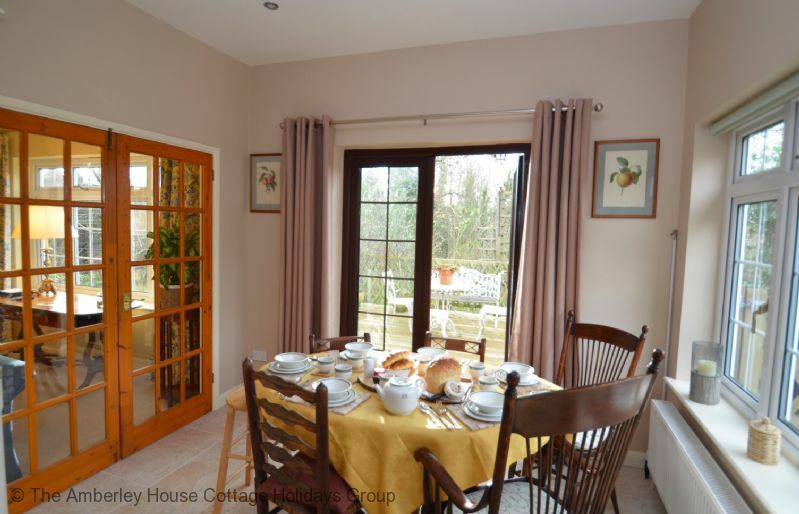 "A beautifully appointed house, with excellent access for a disabled guest. 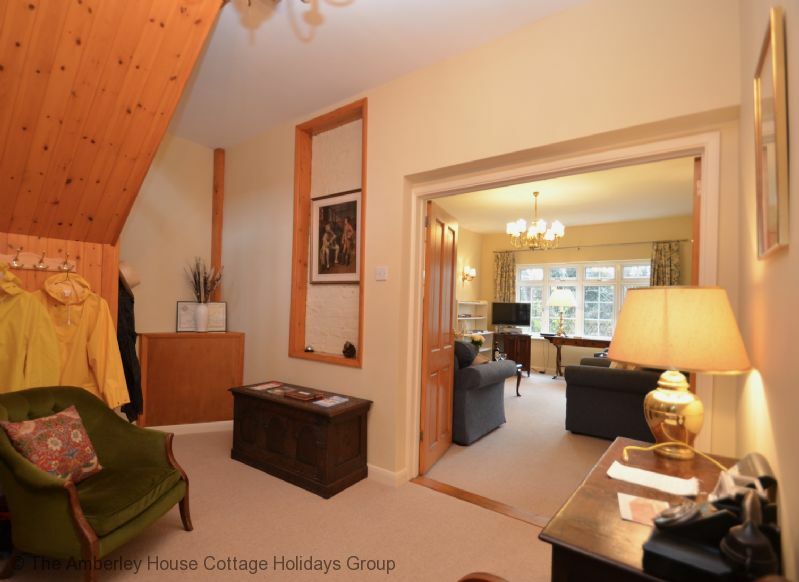 Very comfortable and clean"
"Mountsfield Lodge is in a good location for Rye centre, just over the bridge, the house is lovely with 3 great sized double bedrooms, nice modern kitchen/diner and fabulous setting...plus of course parking. Loads of pubs and restaurants nearby so we had a great 2 weeks there." 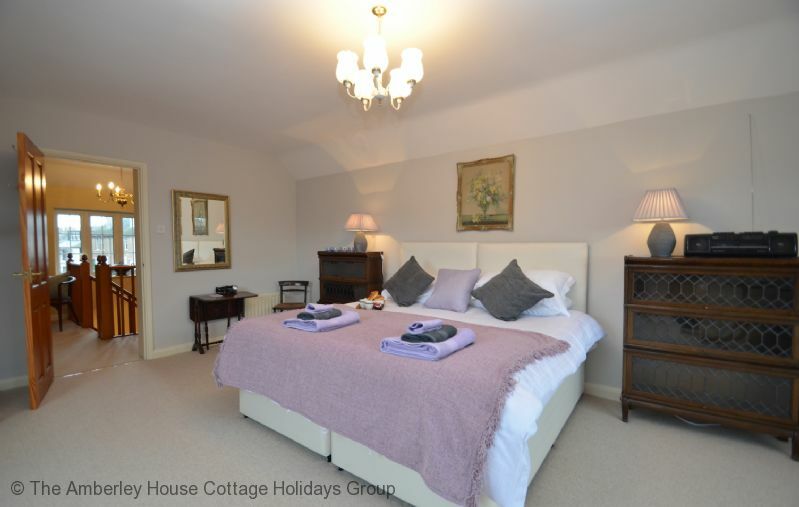 "Perfectly placed within a very short walk of Rye, with excellent parking which is a rarity in this lovely little town. The downside to the location means that there is some traffic noise (and trains, too) but none of us found this to be a major problem. Another reviewer mentioned noisy crows but we never had that problem at all. There are lots of excellent places to eat nearby and loads to do in the surrounding area. The house is very spacious. It was clean, comfortable & very well equipped. 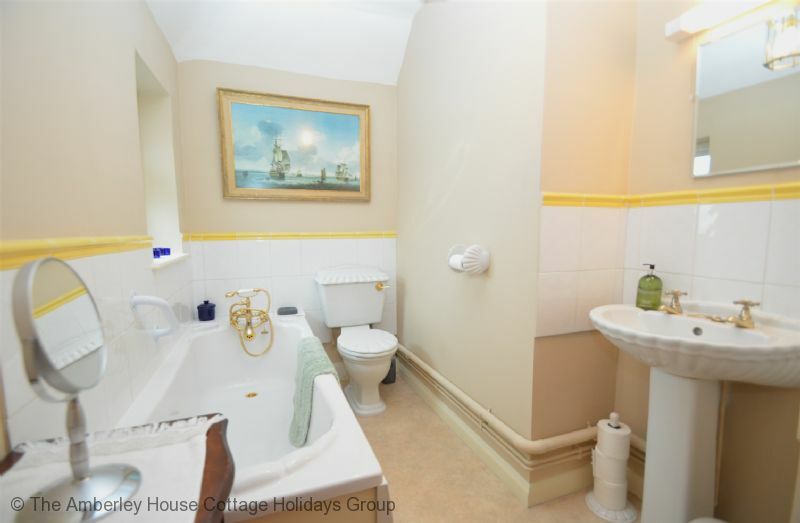 The bathrooms could do with a bit of a refresh as they're a bit dated and a second "proper" shower would be good, but it's obvious the owners are updating the property over time. The kitchen looked like it had been replaced quite recently, and to a very high standard, and the master bedroom had also clearly just been updated. The outside space overlooking the orchard is lovely, but if the weather means you can't take advantage of this there are books, DVDs etc in the house, and a wood burning stove for if the weather is cooler. We would happily stay there again." "Really well equipped and very comfortable. 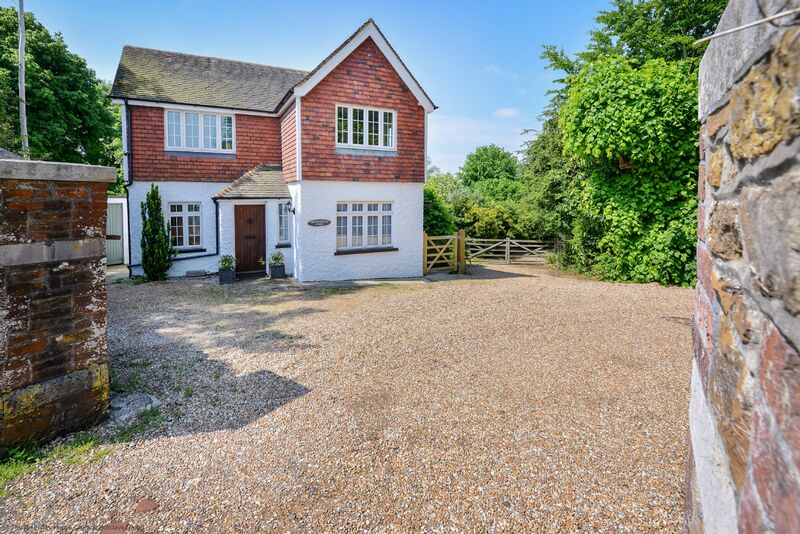 The house is within easy walking distance of Rye town and harbour. We very much enjoyed our stay." 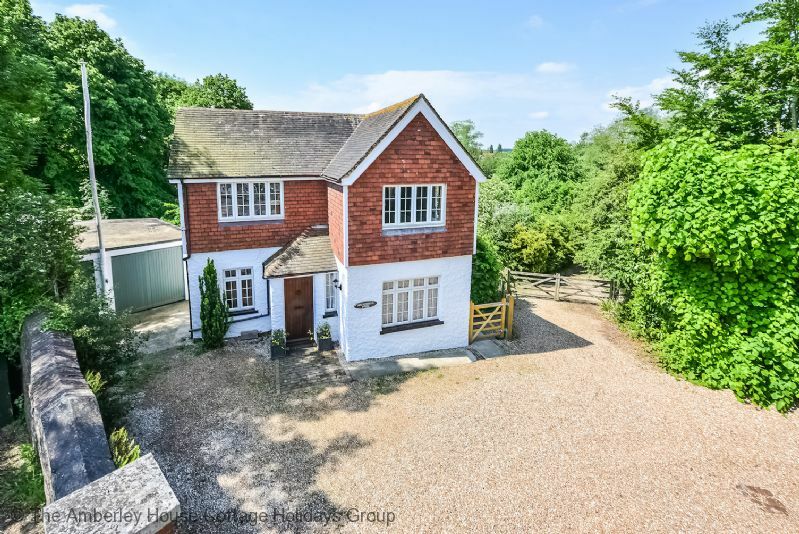 "This charming, historic gate house located on the edge of central Rye provided an excellent base for exploring the surrounding countryside. It has three private parking spaces, a privilege for visitors to the area, and has a fully equipped kitchen with sufficient china etc. for six adults together with a charcoal barbecue (fuel provided). The whole property was extremely comfortable and very clean. A bonus was the lockable shed for bike storage." "Everything you need from start to finish. Well organized and kept informed from booking to stay. Hose clean and well equipped, great space, felt at home. Outside terrace lovely place to sit and watch the wild life. Peaceful, but close enough to walk to amenities. Great central location for surrounding places to visit. No need to look anywhere else for a return stay, just great. Didn't use the barbeque but it was clean and well equipped. The master bedroom is luxury the access room downstairs perfect for our disabled mother." 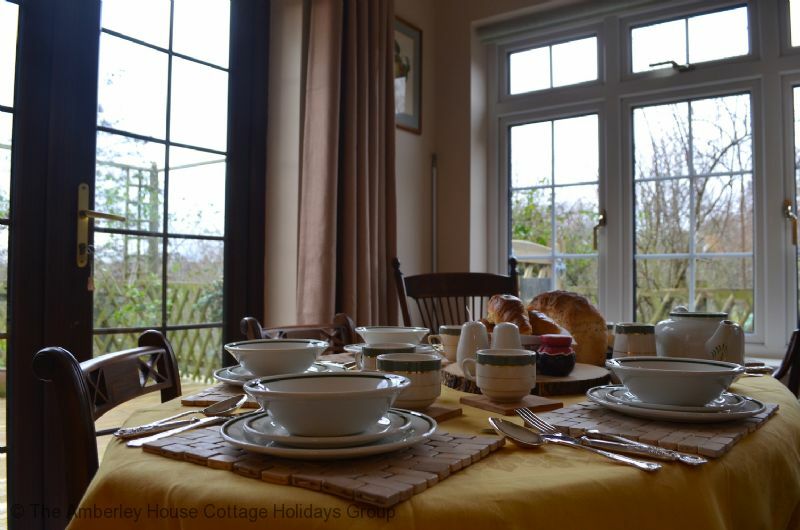 "We booked the house in celebration of Mums 90th Birthday. The downstairs bedroom and en suite bathroom made our break possible as Mum has restricted mobility. The house is in a good location, very well equipped with absolutely everything you need. 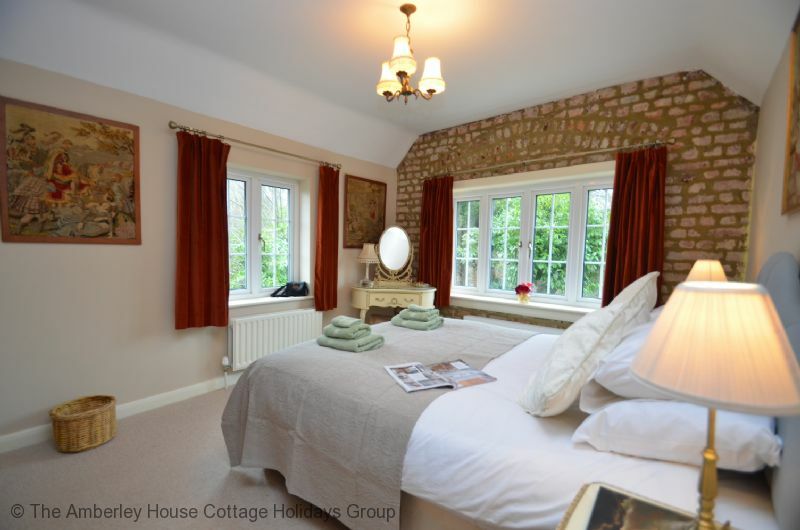 Comfortable beds and quality furnishings, we plan to return now we have found this gem of a house." Our stay at Mountsfield Lodge. 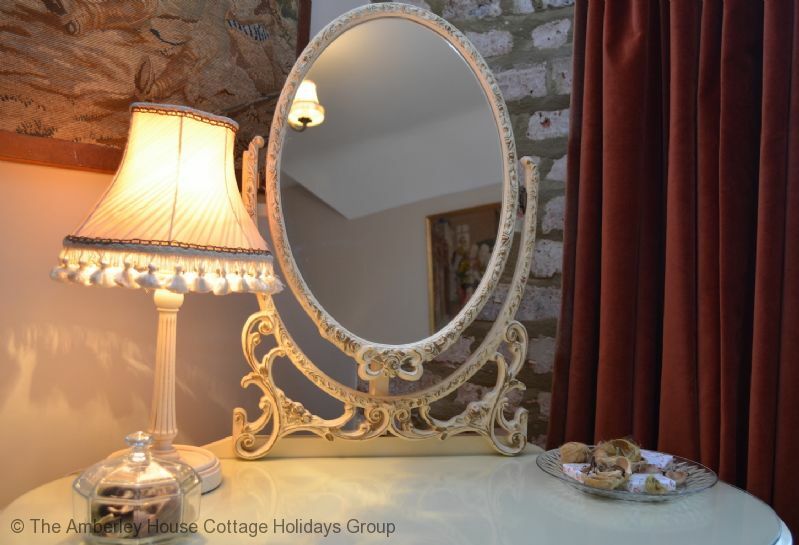 "Mountsfield Lodge is a very well presented cottage, warm clean and with everything provided. There are some very interesting books and pamphlets on local history and it's a three minute walk into town, perfect." 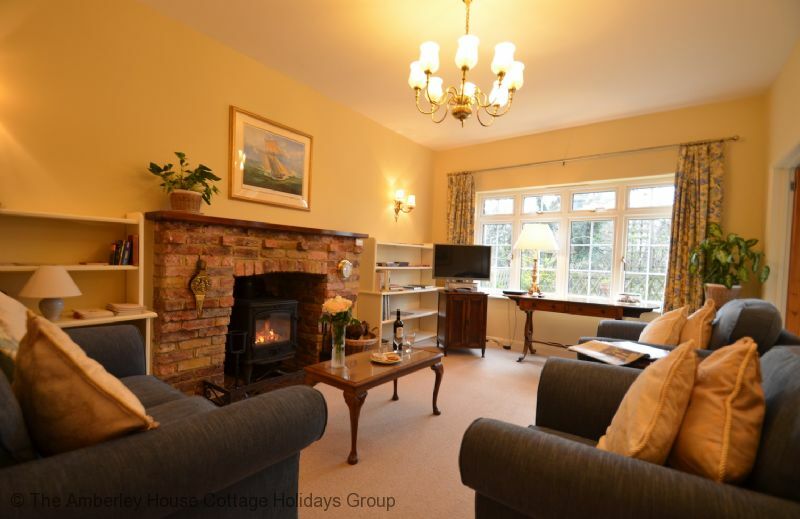 "Mountsfield Lodge was a lovely place to spend our annual fortnight family holiday with three generations. The house was clean and comfortable and within an easy walk of the with shops and restaurants so that we didn't need to always use the cars. There really is plenty of parking (we need three spaces) which has not been our experience in other places where they say there are three spaces. It wasn't cold enough to put the heating on in the whole house, but that did cause a problem in the downstairs shower room where the towels just didn't dry. Some form of extra heating in there would have been useful. It would also have been nice if the sitting room had had seating for six, rather than four as it did. This meant we had to move furniture to accommodate an extra two chairs. Overall though a lovely house in a good position." Thank you for your review, all feedback is always appreciated. We have passed your comments on to the owners and we were reminded that there is a heated airer that could have been used to dry your towels in the downstairs shower room. As you mentioned very unusual to get parking at a holiday cottage in Rye, let alone three parking spaces, making it very convenient if you wish to explore on foot. We hope you choose to stay again sometime in the future. "Stayed for six nights with my husband, elderly mam and mam in law. Mam has limited mobility and the downstairs bedroom and wet room made all the difference to her totally enjoying the holiday. The layout of the house was easy for my mam to get around. The five minute walk into Rye was easily achieved on foot and by my mam with her disability scooter. Owners were very helpful and we would definitely go back. " fabulous base for seeing the sights locally. "We had a fabulous week in Mountfield Lodge. Easy walking into town and a very good pub within 5 minutes walk! Very convenient on Fathers day as traffic queues in all directions so taking the car out was not an option. We were very grateful for the delivery of a couple of fans part way through the week. There was nothing else we wanted that was not already supplied." Lives up to the photographs. "The overall experience was very good and one we might happily repeat. The lodge was spotlessly clean and looked well cared for. 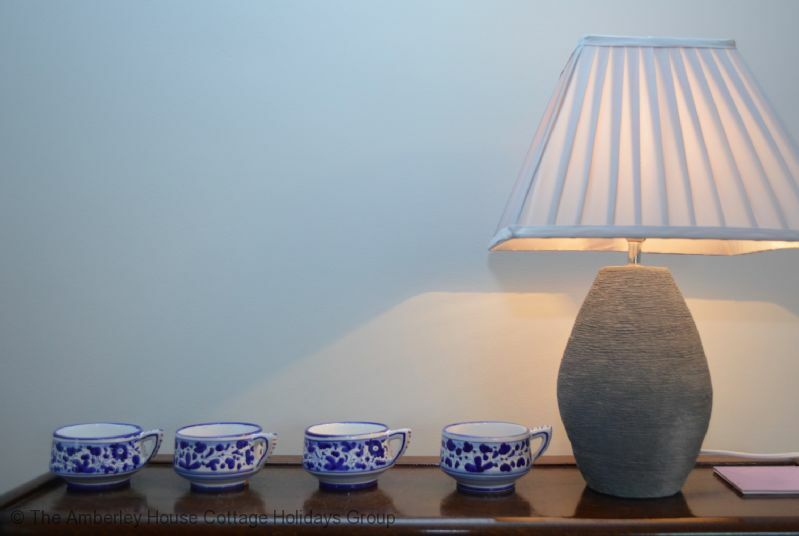 The furnishing was old fashioned but attractive and of good quality. The lodge kitchen was convenient and well stocked but some larger dinner plates would have been appreciated. The collection of books was fascinating, dvds less so. The decking, surrounded with roses and honeysuckle, is an attractive seating area but traffic and train noise is marked, as you would expect from the position of the building. The road is busy and the trains all sound their horns as they pass. The only complaint was that the front bedroom with ensuite shower has curtains that do not exclude light. There is a bright street light outside and the morning sun pours in. Light excluding curtains or blinds would make a great difference, especially as this was the coolest and quietest room." "We were a group of 3 adults and in Rye for a wedding. Our retreat was just perfect, and literally right on the edge of the town and therefore, everything a 5-10 min leisurely walk into the High Street. The location was just ideal, we couldn't believe our luck. The property is gorgeously decorated and every detail thought of. We used the parkas provided in the rain, and we used the sunhats on the decking when the sun came out. We even used the dial in menus when it poured with rain one evening, and it was lovely to be in someone elses home, but have everything to our finger tips, that made us feel right at home. The book collection was also fabulous and my fianc' loved flicking through. One of the other couples also watched a movie from the vast selection provided. We loved every part of our stay and would go back again. Only downside was with 3 couples, there was only an ensuite bathroom including toilet downstairs so we kept going through their bedroom for the toilet. There is a small bathroom for the 2 bedrooms upstairs to share. It would have been useful to have a separate toilet room downstairs, or one built upstairs. Anyhow it was fine as we are all good friends and didn't mind sharing, just would have been handy when some friends visited. All in all this is a wonderful home, and we met the owner who brought us a huge bunch of flowers, when something leaked with the huge down pours ... it was all fine and he was very charming and helpful. Highly recommend this house. Oh, one final tip, take ear plugs as the Crows in the garden apple orchards are very noisy in the morning, as is the main road just outside can be too but again, its not so bad and very bearable ... the Crows almost laughable." 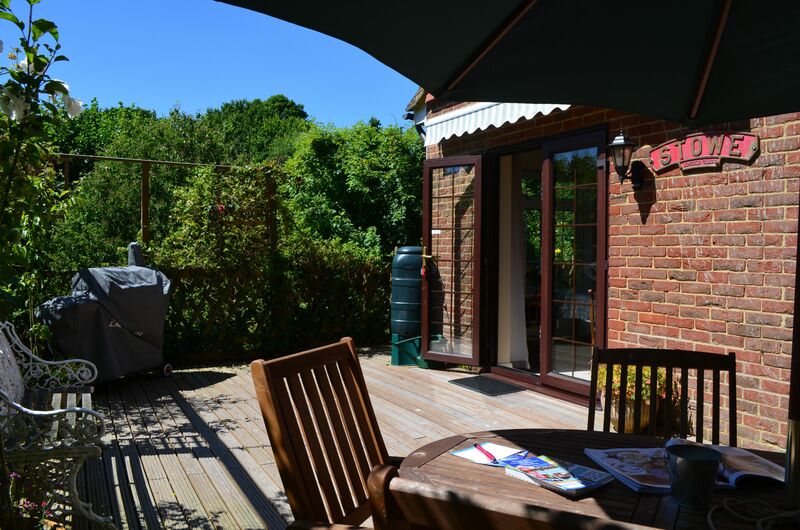 "This was a lovely property just a few minutes walk from idyllic Rye. 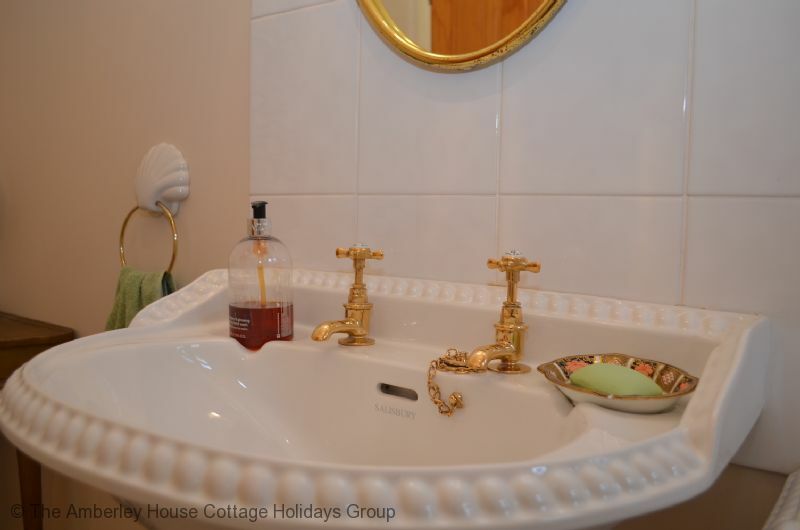 The house was immaculate, quaint & quirky with a lovely homely feel. 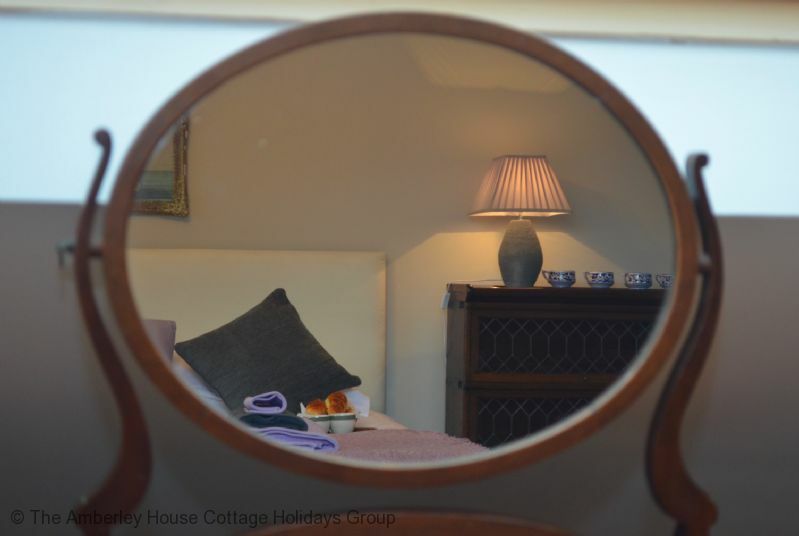 My friends and I had a most satisfactory stay - absolutely splendid!" 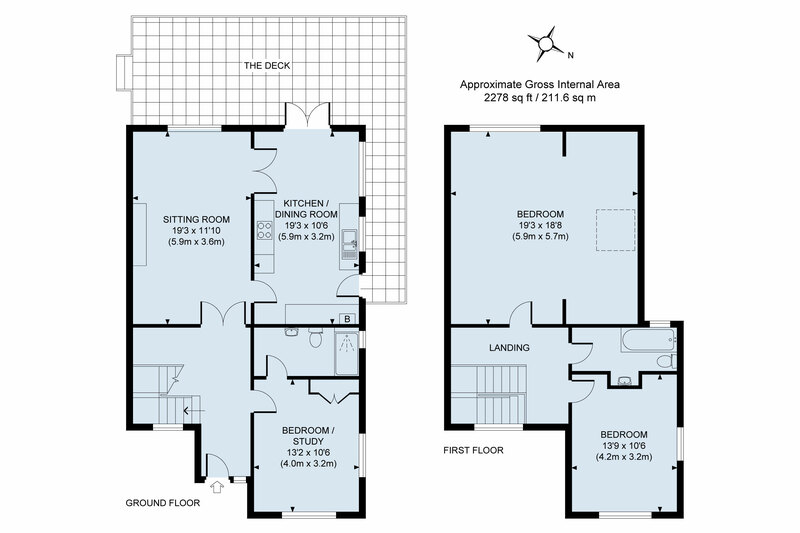 "This was a perfect house for us as it had a ground floor bedroom with ensuite walk in shower. 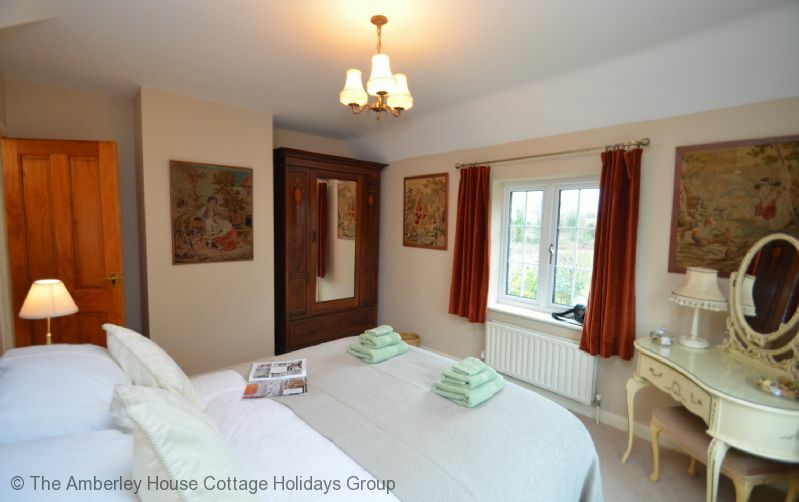 The upstairs bedrooms are very well appointed, very comfortable beds and top quality bed linen. Lovely new decking area overlooking an orchard. 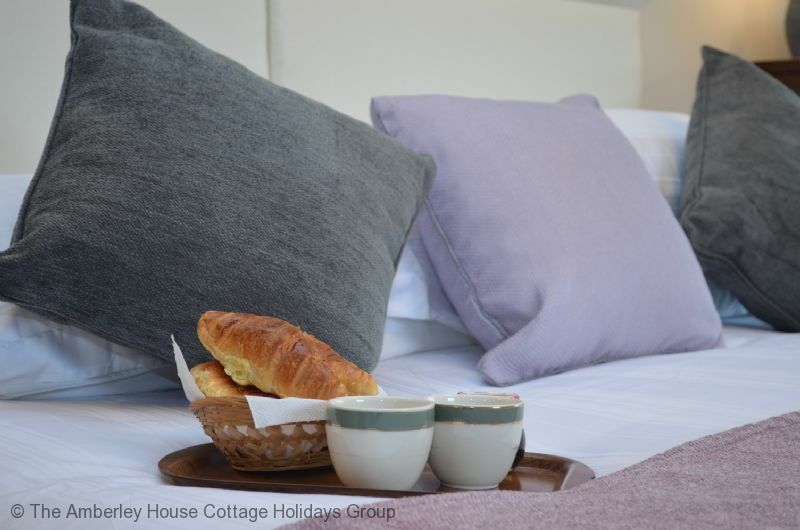 there is everything you could possibly need for a very comfortable stay in Rye. Very easy walking into the town and best of all parking for up to 3 cars, so no worries about car parking. 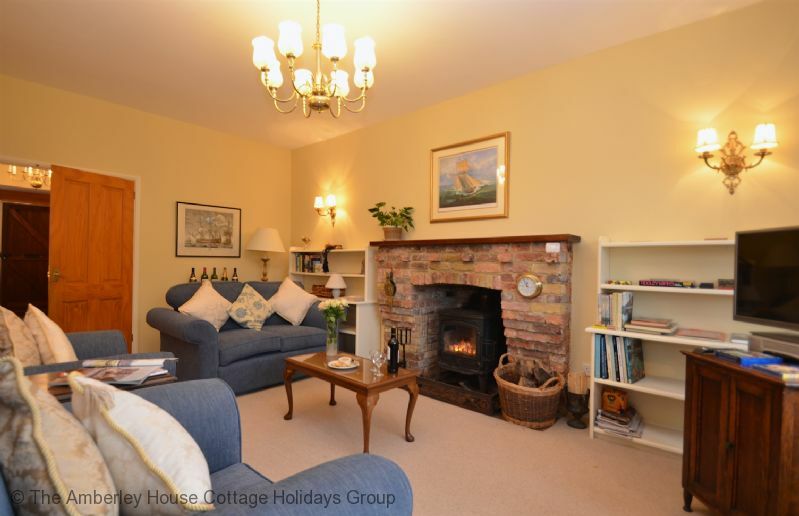 Overall a very attractive house and we had a wonderful break in Rye." "Excellent Location for getting to a wedding in Rye. We were welcomed by some really thoughtful gifts, thank you. Immediately we felt right at home, the house and grounds were just perfect. We didn't want to leave. " "When we arrived our expectations were blown away ,this house was much more than we expected Presented to a very high standard and a very nice welcoming pack made the initial opening of the front door a very nice sight Once we had looked around the house we knew we had made the perfect choice and Would highly recommend "
"We had a fantastic stay at the cottage. It was home from home. Everything is provided, linen, towels, shower get etc. Plenty of information on on the area provided and the location of the cottage was excellent to explore Rye. You will not be disappointed. "